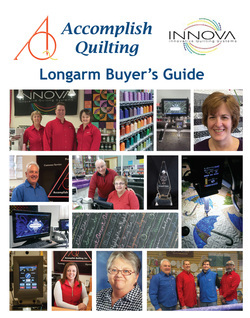 REQUEST OUR NEW INNOVA LONGARM QUILTING MACHINE BUYER'S GUIDE! Why should I buy an Innova Longarm Quilting Machine from AQ? Our Buyer's Guide is chocked full of information for you to make wise decisions in purchasing a longarm quilting machine, obtaining financing, getting service in our store or in your home or online, plus phone/online ordering of all quilting supplies. Yes! I would like a copy of your Buyer's Guide! ​Rush one to me please! The Top 10 things to Look out for when Purchasing a Longarm Quilting Machine. About Us-meet the team that offers every aspect of support prior, during and especially after the sale. A full display of all the Innova machines. The specs on our machines and how to plan fitting an Innova into your sewing studio. The benefits and features of the world class Innova. We believe the finest machine on the market! The Real "Skinny" on Financing and what is the most attractive way in which to obtain financing for your new machine with low interest with minimal risk. Three companies that finance with their contact information. COMING SOON! Article on "The Truth about LIFETIME WARRANTIES". Our Warranty - explains all that you need to know! A Tax Incentive guide on how to create your own tax break when using your longarm for business. We share with you our full array of services: Our full array of quilting products-batting, thread & notions, tech service-in our store, in your home, over the phone 24/7/365 by ABM and 7 days a week through Accomplish Quilting.